I’m not so different from most people. I eat with a knife and fork and even know how to use them whether I’m at home, in France, or wherever I happen to be. I keep my elbows off the table (at least in restaurants or at other people’s homes), sit with my back straight, and keep my feet on the floor. I do not rock back on my chair’s back two legs either. I chew with my mouth closed – always (and that also applies to chewing gum) and never talk with my mouth full – the person I know who does shall remain nameless. I make eye contact with my companions and engage in conversation where we take turns – a seemingly forgotten point of etiquette these days – rather than drown each other out with a barrage of words that flow in an endless stream from both sides. And with decidedly few exceptions, I’m as ladylike a woman as you’d ever meet. The same is true of my daughter, Laura. Laura has lived in France at different times and places: Faverges, Strasbourg, and Paris. A true Francophile, she incorporated some eating habits of the French while she was there. If you cut meat with your right hand while steadying it with a fork in your left, you eat from the fork using your left hand, rather than wasting energy switching hands, something the French consider pointless. When the greens in your salad have not been cut into bite-sized pieces (something they never seem to be wherever you are), you use your fork to fold over the romaine, escarole, or whatever in a tidy little envelope (a delicate operation that takes some practice) so you can raise the singular package to your mouth without unhinging your jaw like a boa constrictor to get it all in. Very French – very lady-like. What Laura and I are remembered for, however, are our not-so-stellar moments. My mother makes a dish we all simply call “sauerkraut” which bears a close resemblance to pigs in a blanket, but Mom’s is the version that accompanied her and my grandmother on their journey to American shores in the 1930s. And yes, we think hers is the better version, made in a thickened gravy-like sauce. And as Mom always has, she makes a huge pot of it, dividing it between those of us with our hands waving in the air. A few weeks ago, I took Tupperware containers for Laura and my son, Jeff, and one for me, and scooped out as much as Mom allowed from the large roaster she uses to cook it. When I gave Laura hers, she tossed it in the microwave almost before I could set it on the counter. When it was ready, she dug into it with her fork, pulling out an errant strand of hair that turned up in her first forkful. Normally, words like “gross” and “disgusting” would have quickly followed and might have stopped her from eating it. I hadn’t made it, so she couldn’t blame me for being negligent with regard to keeping my hair back, though I have occasionally been guilty of that a time or two (okay, maybe three). More importantly, this was sauerkraut. She pulled out the hair, held it up for examination, then tossed it aside. I was shocked by the deadened sensibility she showed, her almost careless acceptance of this foreign object, its unwelcome presence in the midst of her food, and her seeming disregard for its ability to contaminate her dinner. To taint what she was about to put into her mouth. A rationale she could live with quickly developed. A reason not to get rid of the meal she wanted to eat. The meal Mom did not make often enough to suit either of us. “It has my DNA,” she said. This was something I could sink my teeth into. And really, I had no room to say anything to Laura anyway, given my penchant for rationales with regard to where food had come from, or been. favorite – and one we can’t get here in the states because it’s made from raw milk. 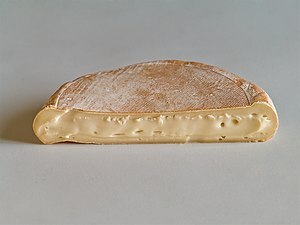 Reblochon is made on farms in the mountains of the Haute Savoie and is, to use a well-deserved cliché, to die for. Absolutely. Throw food away? Are you kidding? We started in on the cheese and got to laughing; maybe it was the beer. Whatever the case, we were having a great time when I accidentally dropped the last piece of cheese on the floor between our feet. Mountains flew past in one long blur. Time slowed. Nothing moved but our eyes. We both looked at the cheese, then at each other, and in less than five seconds (assuming you’re familiar with the five-second rule) I snatched up the cheese, brushed it off with my fingers, and popped it into my mouth. Waste not, want not. Not merely a good axiom to live by, but mighty tasty, too – the questionable source of its DNA notwithstanding. This entry was posted in Fun With Food, On Family and Parenting, The Power of Words and tagged comfort food, Family, family meals, Francophile, French cheese, German beer, Haute-Savoie, manners, Reblochon, sauerkraut, table etiquette on February 27, 2013 by lindagwhite.